I completed 90% of this painting a month or ever two months back, the last 10 % has taken a lot more time. I learned this from Chien Chung-Wei, he might spend two hours on a painting but the final 10% can take many more hours – days even. Luckily for me the weather is so damn cold here in Stockholm that the snow doesn’t look out of place now that it is spring, it was snowing here today in fact. 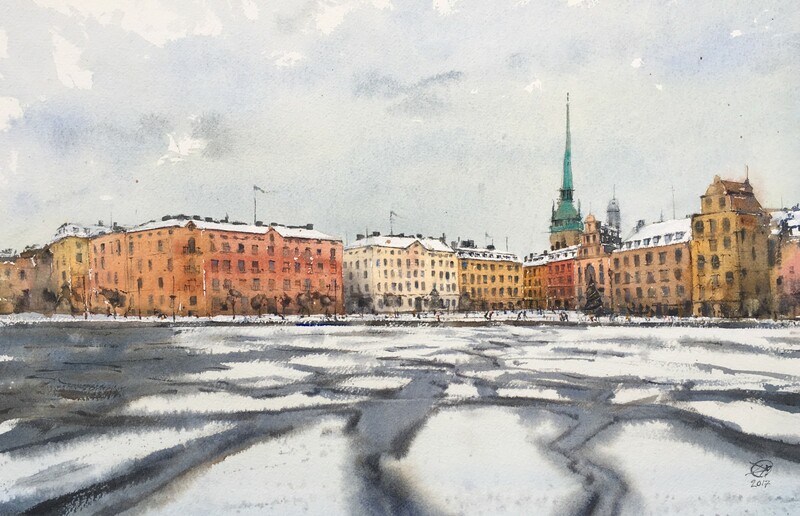 So, maybe I should rename this painting to, “Spring in Stockholm”. Only kidding, I do look forward to warmer weather though. Painted on Arches rough 300g, 2017.04.25, 52 x 34 cm. Click on the image below for a larger image.